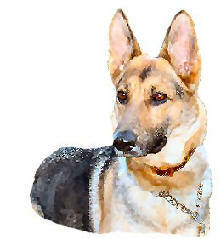 This page presents links to other sites of interest to GSD owners and dog owners in general. We do not endorse or recommend any of these sites--we offer this page for information only. People With Pets - www.peoplewithpets.com is a resource directory of pet friendly apartments and hotels as well as links to pet related services and products. Estate Planning For Pets - Here's some guidance to help you plan for your pet should you no longer be around to care for her, from The ASPCA, The Humane Society and NOLO.com. Practical Paw - An online resource for dog lovers looking for practical advice, guides and reviews. dogfoodweb.com - Everything Dog Food, from Active Life Dog Food to Wholesale Dog Food. www.cybercanine.com - Makers of Grrroom Dog - An Earth Friendly Holistic Spa Treatment With A Growl - And Organic ToGo! Dog Biscuits With A Bite! 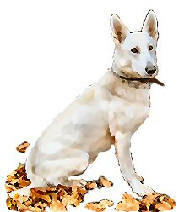 Gourmet Dog Treats - We are a gourmet dog bakery. We hand make our dog treats daily and sent them to you fresh. We use all natural ingredients in our dog treats. You're dog will be beggin for more! West Arundel Crematory - Recommended by MAGSR - A pet is a family member and, as such, should be treated as any other member of the family. You love your pet and may treat the animal as a child or best friend. We believe in treating our pets the same way. When a pet dies it can hurt as much as losing a family member or a close friend. Websites of Interest - pet information search engines, directories, etc. My Pets - The complete guide to choosing and caring for your pet. Pet Names, pet care, pet informatiom, help chosing a pet and more. The Animal Rescue Site - Help us feed hungry shelter animals with nothing more than a click of your mouse. Dogs Deserve Better - a nonprofit organization dedicated to freeing the chained dog, and bringing our 'best friend' into the home and family. www.artbyhagerman.com - Get your pet's portrait! Dogs Finding Dogs - Our noses know where your dog goes. K9 Tracking services for lost pets. Crate Haven - Designer Crates for Posh Dogs! their training and care and more. http://www.smartpakcanine.com - SmartPak Canine is a website that sells a wide-range of canine products for dog and owner, including many products focused on canine health and well-being. This site also contains a few educational resources for dog owners. Dog Beds - Precious Pets Paradise has been offering the complete line of dog and cat items ranging from dog beds, airline pet carrier, memory foam dog beds, large dog beds, dog ramps, heated dog beds, heated cat beds, pet strollers, dog strollers, dog pet beds, cat bowls, designer dog beds, extra large dog beds and on and on and on! The Recovery Village - Personalized addiction treatment. To highlight the mental health benefits of pet adoption, we're trying to spread the word and encourage more people to adopt! We've written this comprehensive resource related to pet adoption. Large Dog Beds at Mammoth Outlet, specializing in large breed orthopedic dog beds for over fifteen years.